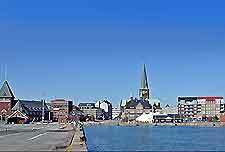 The second-largest of all Denmark's many cities, after Copenhagen, Aarhus (Arhus) is the true cultural centre of the westerly Jutland peninsula. Aarhus is both a university and coastal city, and is home to one of the most developed entertainment scenes in the whole of Denmark, with plenty to do after hours. Founded in the early 10th century, tourists visiting Aarhus will soon encounter the historic quarter, will is chock-full of museums, churches, medieval buildings and Danish landmarks, while others prefer to head to the coast, where there are a number of sandy beaches and scenic woodland trails. Often marketed as the 'World's Smallest Big City', central Aarhus is relatively compact and offers a well-developed tourism infrastructure, with the shopping districts around Sondergade and Sankt Clements Torv close by and leading to the Domkirke (cathedral). The tourist information office (Tourist Arhus) is situated within the Radhus (City Hall), on the Radhuspladsen and off the Park Allé. Start your sightseeing of Aarhus with a guided tour of the city, which will always pass the main tourist attractions around the centre, such as the 14th-century Domkirke Cathedral that took around 100 years to complete. Something quite different is the modernist City Hall (Radhus), whose contemporary architecture you either love or hate. For families in Aarhus, the Tivoli Friheden Amusement Park is the place to be and lies on the southerly outskirts of the city centre, offering a range of fast rides and live entertainment. 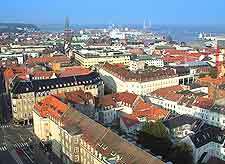 More information about Aarhus Tourist Attractions and Landmarks. As one of Denmark's most important cities, Aarhus is rightly home to some of the very best museums in the country. Celebrating the Viking past of Denmark, the Vikinge Museet is always a good place to start the day and contains many ancient Viking artefacts found here during excavations just over 50 years ago. Move on then to the ARoS Aarhus Kunstmuseum and enjoy some serious art works, spread over ten floors, while for something quite different, visit the open-air museum that is the Den Gamle By, home to around 75 buildings transported from all over Denmark. 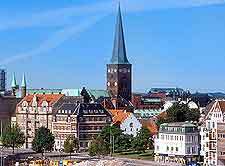 More information about Aarhus Museums and Art Galleries. With so many quality attractions outside of Aarhus, it makes sense to leave a day of two to properly explore this part of Denmark, especially the popular area known as the Danish Lake District (Sohojlandent) and its Sky Mountain (Himmelbjerget). The city of Randers is also close to Aarhus and contains a notable tropical zoo, while nearby Herning and Mariager are perfect for museum buffs. Mairagers also offers popular rides on a paddle steamer during the summer, along with a number of recreational activities. 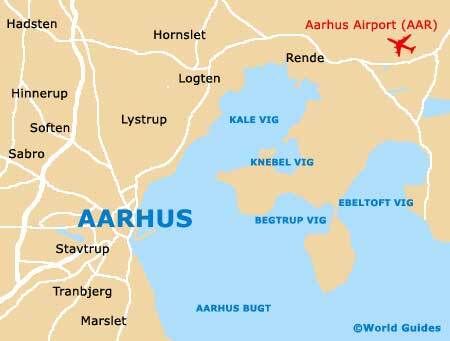 More information about Aarhus Attractions Nearby.